Violin Pickup – The Band – Headway – Best price – will match any authorized dealer price! I’m a professional recording and performing Musician. For best sound I always use a good EQ-Preamp like the Headway EDB – 1 or the LR Baggs Venue DI. May use pickup without but way better with EQ – DI. My songs can be heard at garyritterstrings. I guarantee this pickup or money back. After trying every pickup I could get my hands on I found this Pickup to be the best. Most Natural sound I have ever heard. Never causes feedback on the gigs. Way better than using a Mic that always causes feedback. Shipping Outside Lower 48 States – USA – HI. – PR. will be calculated. 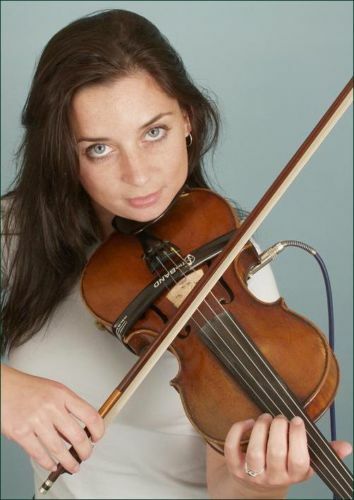 Headway’s The Band Violin Pickup Sytem gives you a compact, durable, and easy-to-install pickup capable of providing electric amplification for your violin or viola without the need for any destructive modifications to the instrument itself. The benefits of The Band are many: You’ll get far greater volume levels before feedback compared to using a microphone. In addition to cutting feedback, The Band reduces bowing noise and body sounds and gives you the ability to filter out excessive treble. Thanks to The Band violin and viola pickup you’ll have more freedom to use the stage when you’re no longer tied down to your microphone stand during performances. Just think how much faster you’ll get through sound checks with this unique band-shaped pickup on your violin or viola! 1. Pass the end of The Band pickup tube under the strings between the bridge and the tailpiece and wrap it around the violin’s waist. 2. Strap the 2 ends of the tube firmly around the violin’s back and secure with the provicded Velcro&reg; strip. Headway’s The Band instant pickup works equally well on violins and violas and is covered with a stylish black material that will not detract from your instrument’s appearance.